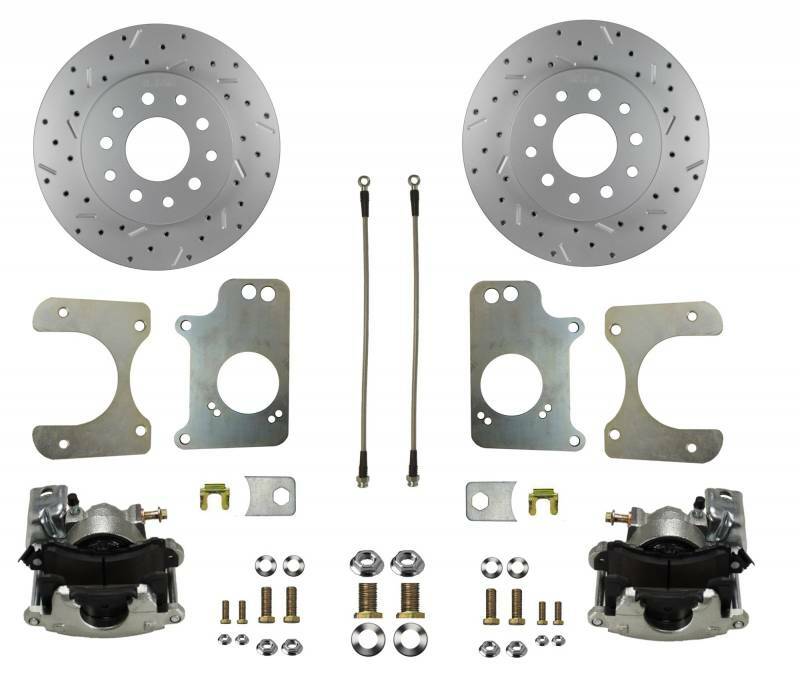 Click on a product image below to view more info on your GM 10 bolt rear end disc brake conversion kits. As an upgrade to our standard rear disc brake kit you will receive our MaxGrip XDS Rotors and Stainless Steel Braided Hoses. The MaxGrip XDS Rotors are precision drilled and slotted to provide better cooling and gas dissipation for maximum grip. The rotors are coated with an OEM style Spray Zinc Finish which keeps the rotors clean and corrosion free. The stainless steel braided hoses provide increased protection against tearing or cutting from any debris you may encounter on the road. 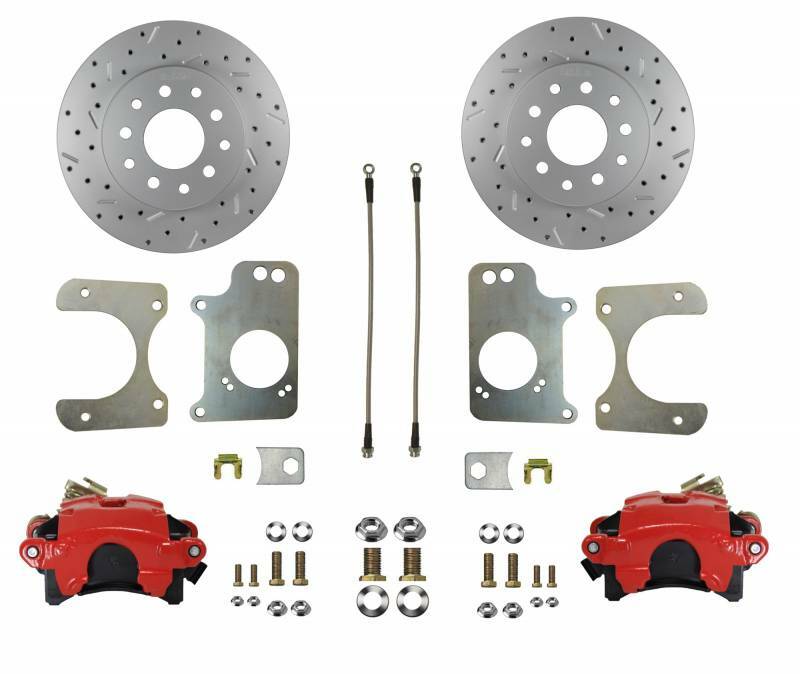 As an upgrade to our standard rear disc brake kit you will receive our Red Powder Coated Calipers,MaxGrip XDS Rotors and Stainless Steel Braided Hoses. The MaxGrip XDS Rotors are precision drilled and slotted to provide better cooling and gas dissipation for maximum grip. The rotors are coated with an OEM style Spray Zinc Finish which keeps the rotors clean and corrosion free. The stainless steel braided hoses provide increased protection against tearing or cutting from any debris you may encounter on the road. The Red Powder Coated Calipers, outside of looking cool will also provide corrosion protection to keep your brake system looking and functioning like new. As an upgrade to our standard rear disc brake kit you will receive our Black Powder Coated Calipers,MaxGrip XDS Rotors and Stainless Steel Braided Hoses. The MaxGrip XDS Rotors are precision drilled and slotted to provide better cooling and gas dissipation for maximum grip. The rotors are coated with an OEM style Spray Zinc Finish which keeps the rotors clean and corrosion free. The stainless steel braided hoses provide increased protection against tearing or cutting from any debris you may encounter on the road. The Black Powder Coated Calipers, outside of looking cool will also provide corrosion protection to keep your brake system looking and functioning like new. 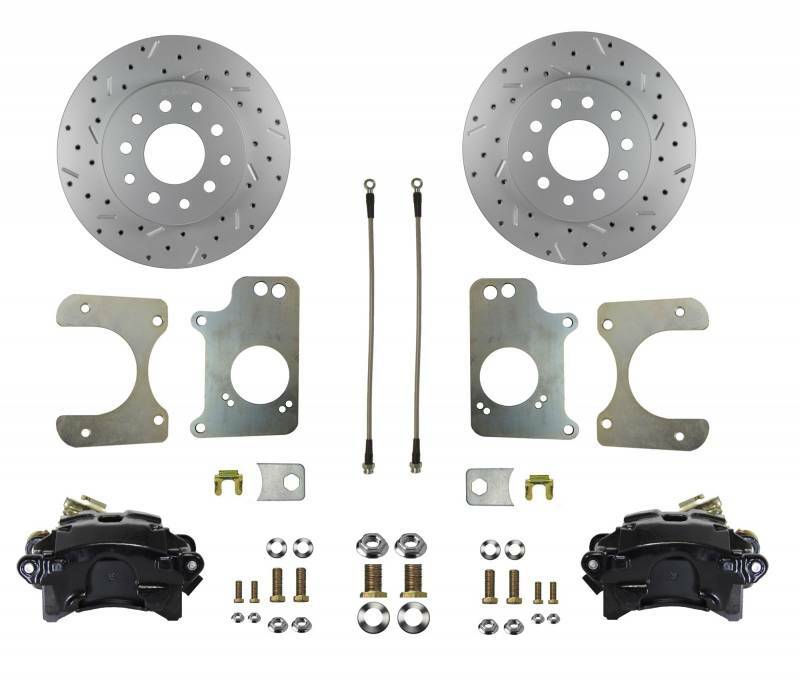 LEED Brakes is excited to announce the release of our Rear Disc Brake Conversion Kits for GM 10 Bolt 7.5 & 8.5 axles with a 3 Bolt Flange. The conversion kits are designed to bolt directly to axle housings with no modifications. Each kit is made to be a direct fit to your vehicles axle with parking brake provisions. Each kit includes precision machined caliper mounting brackets and spacers with a rust resistant zinc plating. All calipers are assembled with a 54mm single piston with a built in parking brake. The caliper also receives a zinc plated finish for rust protection. Every caliper is individually tested after assembly to ensure you receive a top quality caliper ready to work out of the box. All kits include all the necessary mounting hardware and complete instructions to make for an easy installation. Every LEED Brakes product must pass a stringent quality inspection prior to shipment to ensure our customers receive only the highest quality brake products. Installation of our kits is a breeze with step by step installation instructions and expert tech help both on our website as well as live help over the phone. 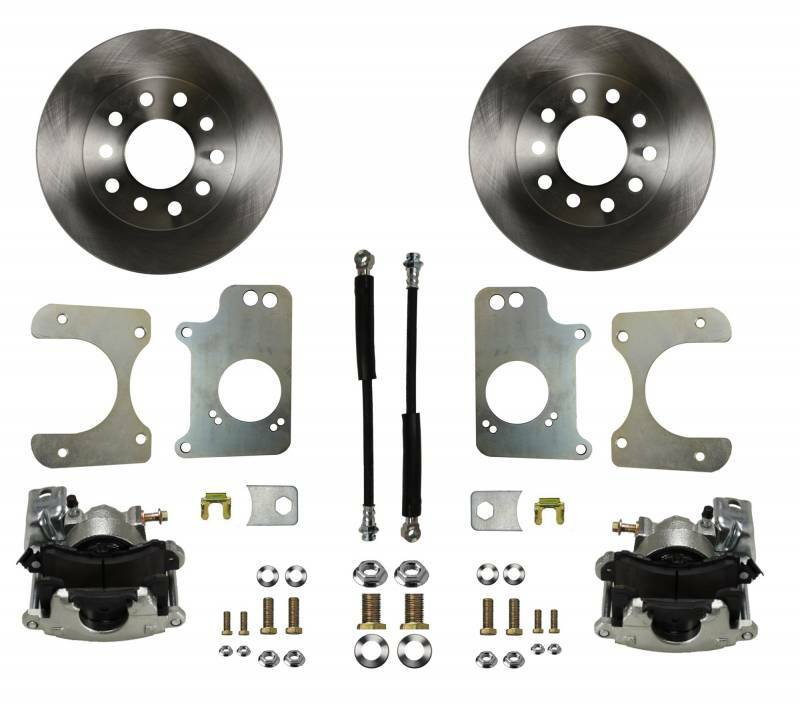 In most instances your stock master cylinder will work with this kit. GM Cars & Trucks are one of the most heavily modified vehicles on the road today. Changing your wheel size, axles, adding more weight, power, ect.. can really affect your braking performance and pedal feel. Our tech team can provide you with a list of master cylinders that will work on your vehicle if you need to improve your pedal feel. If you do have any questions about the brakes for your rear axle please call our tech experts at 716-852-2139.